The only way to prevent cavities is to practice good oral hygiene by brushing and flossing teeth twice a day and visiting our office for a checkup at least twice a year. Tooth decay is a progressive condition resulting from the interaction of natural mouth bacteria and sugars (carbohydrates) in our everyday diets. These sugars are consumed and digested by the bacteria, which in turn produce tooth eroding acids that break down tooth enamel to form cavities. Dr. Rohner can remove the decay and restore the tooth to a healthy state. However, permanent nerve damage can result from severe decay and may require a root canal and dental crown to save it from extraction. Avoiding this decay requires good oral hygiene, like brushing and flossing twice a day and regular dental checkups, along with a healthy diet and the occasional fluoride treatment. Helping your child avoid cavities will help you avoid costly treatments in the future. Children require special tools and techniques to brush properly. For your child, use a toothbrush with soft bristles along with a small strip of fluoride toothpaste. If your child is younger than age 3, you should help them clean their teeth with water and a soft-bristled toothbrush. 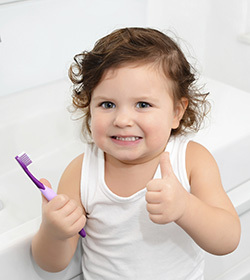 After age 3, you should only supervise brushing. They should be using no more than a pea-sized amount of toothpaste at this point. It’s also a good practice to periodically remind your child not to swallow excess toothpaste. When your child brushes their teeth, they should move the brush in small circles to reach food particles that may be under the gum line. They should hold the toothbrush at an angle and brush slowly and carefully, covering all areas between teeth and over the surface of each tooth. Also remind them to gently brush their tongue and the roof of their mouth before they rinse. 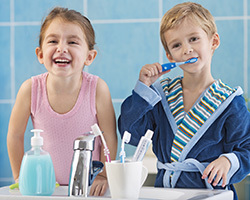 It should take your child about two minutes to thoroughly brush their teeth. When Should a Toothbrush Be Replaced? As soon as the bristles start to wear down or fray, replace your child’s toothbrush with a new one for optimal oral hygiene. For areas between the teeth that a toothbrush can't reach, dental floss can be used to efficiently remove food particles and plaque. It is very important to floss between teeth every day. They should start by pulling a small length of floss from the dispenser. Then unwrap the ends of the floss tightly around their middle fingers. They should guide the floss between all teeth to the gum line, pulling out any food particles or plaque. Then, they should unwrap the clean floss from around their fingers as they go, so that they have used the floss from beginning to end when they finish. 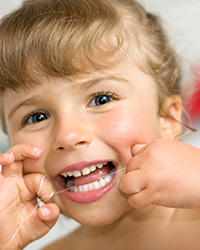 Your child should floss before bedtime to make sure their teeth are squeaky clean before going to sleep. Bring your child in for a checkup if flossing causes their teeth to bleed, as this is a symptom of beginning stage gum disease. The grooves and depressions that form the chewing surfaces of the back teeth can be extremely difficult to keep clean and free of bacteria and food particles. In fact, over 88% of all cavities develop in this area of the mouth. Dental sealants can protect these vulnerable areas by covering the grooves and depressions and preventing bacteria and food particles accumulating. Dental sealant material is a simple resin that can last for several years but should be checked during regular appointments. Fluoride is a natural substance that can strengthen teeth and help them resist decay. Most tap water is pre-treated with fluoride and brushing regularly with fluoride toothpaste ensures significantly lower cavities. Dr. Rohner also offers fluoride treatments to provide extra protection from decay for your child’s healthy teeth. Your child should visit our office twice a year (once every six months) to maintain a healthy smile. 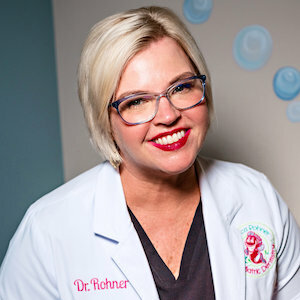 Dr. Rohner will carefully examine your child’s teeth and provide an evaluation of existing dental problems and proposed treatment plans. If your child has a dental emergency in between visits, you can call our office for immediate assistance. Read the AAPD Recommendations, here!